The Nation huronne-wendat is the only Huron / Wyandot nation in Canada. Until the mid 17th century, the Wyandot Confederation, made of 4-5 tribes, lived on a big territory stretching over modern Ontario and Quebec. The Confederation was disbanded in 1630-1650; most Wyandots were killed by epidemics or during the wars against the Iroquois. The survivors split into two groups, the Great Lakes Wyandots and the Hurons - Wendat; the latter group (c. 300 people) moved to Quebec, where they move from place to place until settling in 1697 in the village of Lorette. The place, subsequently known as Village-des-Hurons, was officially renamed Wendake in 1986. Wendake (c. 2,700 inhabitants), the center of a reserve (c. 1,100 inhabitants), houses the Conseil de la Nation (Nation's Council) huronne-wendat, made of the chiefs of the eight family circles constitutive of the Nation and of the Grand Chief. The flag of the Nation huronne-wendat is white with the nation's emblem in the middle. The nation's emblem shows a beaver standing on a heap of branches and holding a green branch in its paw. The branches stand in the middle of dark blue water, under a light blue sky charged with a white cloud and seven geese. The Huron Wendat Nation's symbol represents its culture, territory and history. 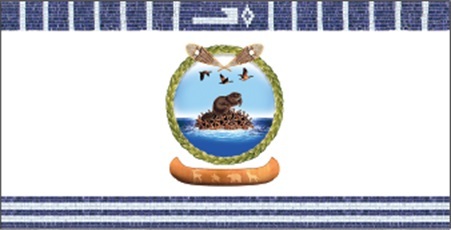 The symbol on the flag is accompanied by belts of wampum. The Bustards (large terrestrial birds) recall one of the most important beliefs of the Huron-Wendat Nation: the creation of the world. While Yäa'taenhtsihk (Skywoman) fell from the celestial world, bustards gathered it on their wings and placed it on the carapace of Grande Tortue, the chief of the animals. The Great Turtle eventually became a wonderfully beautiful island, our Earth. Canoeing and Snowshoeing represent the means of transport used for travel on the territory. The water, the source of life, forms the paths to follow between the division of territories. The Hut represents the community, homes and the roof that protects our families. It is also a symbol of strength and agility for work. The Circle and the Sweet grass – The Huron-Wendat see all the elements of nature interconnected. All life, including humans, animals, plants, spirits, etc. forms a whole called the Circle of Kinship. The sweet grass represents spirituality, medicinal plants and the forest. The Clans include the deer, the tortoise, the bear, the wolf, the beaver, the eagle, the porcupine and the snake. Five of these clans made up the great Nations of the confederation: the Attignawantans, the Attigneenongnahacs, the Arendaronons, the Tahontaenrats Daim and the Ataronchronons. Four (of the eight) clans are represented at Wendake reserve: the deer, the wolf, the bear and the turtle. The Beaver – The national emblem of the Huron-Wendat Nation, the beaver alone represents a clan. The most industrious of all animals, it is a symbol of endurance, intelligence and pride.